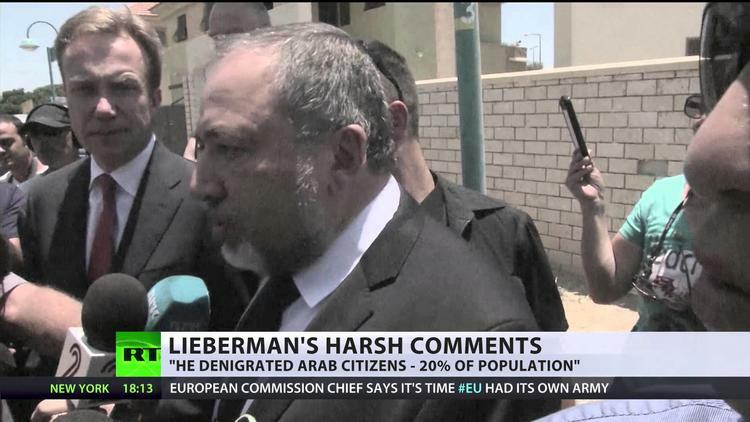 Israeli Foreign Minister and the head of Yisrael Beiteinu Party, Avigdor Lieberman, lashed out at Israel’s Arab citizens, Sunday, threatening to cut their heads off with an axe. “Those who are with us deserve everything, but those who are against us deserve to have their heads chopped off with an axe,” Lieberman said during an election rally in the western city of Herzliya, according to Al Ray correspondence (Andalou). Meanwhile, he added that there was no reason for Umm el-Fahm, an Arab city in northern Israel, to continue to be part of his country. Born in Moldova, Lieberman is one of the only foreign ministers in the world who does not live in territory officially recognized as his own country. Originally under suspicion over charges of money-laundering and bribery, Lieberman was formally indicted in December of 2012, on lesser charges of fraud and breach of trust. His party was recently the focus of a corruption probe within the Israeli political spectrum, and, more recently, Lieberman’s life was threatened with an assassination attempt. Israel took control of Umm el-Fahm in 1949, in the light of the Armistice Agreement between Israel and Jordan. It is the third largest Arab city within Israel, as far as population size is concerned. During Sunday’s rally, Lieberman said that those who raised the black flag of what is called the “Nakba Day” in mourning over the establishment of Israel, did not deserve to belong to the state of Israel. “I am quite willing to donate them [the people who raise the black flags] to PA chief Mahmoud Abbas,” Lieberman said. “It would be my pleasure,” he added. During last year’s Nakba Day solidarity protests, two Palestinian teens were killed by Israeli soldiers for no apparent reason, raising only token concern within the international spectrum. He called for including Arab states and Israel’s Arab citizens in any settlement with the Palestinians. Lieberman said Israel should seize the opportunity of the presence of similar points of view with Arab states, even without mentioning what these points of view were about. He said there could not be a bilateral settlement of the Palestinian-Israeli conflict, calling for a regional settlement that included Arab states and Israel’s Arab citizens. “The Palestinians know what is being said about them now in the Arab world,” Lieberman said. He added that some Arab states believed that real threats came from the Palestinian faction Hamas and the militant group Daesh, not from Israel.